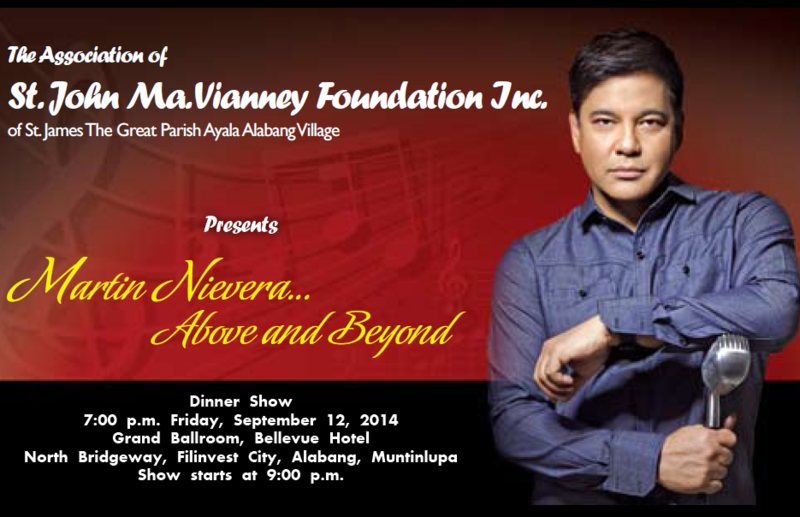 The Association of St. John Marie Vianney (ASJMV) of Saint James The Great Parish in Alabang is having a fundraising concert on September 12, 2014 at The Bellevue Hotel. Enjoy a sumptuous dinner and be serenaded by the country's top performer, Martin Nievera, as he sings pops and ballads at the Grand Ballroom of The Bellevue Hotel Manila. This is a one night only show you can't miss! We are inviting everyone to support ASJMV in their mission to promote priestly vocations by providing for the education needs of poor but deserving seminarians. The association has helped a total 37 seminarians who have all graduated and ordained to into priesthood. Proceeds of this year's fundraising event will benefit the 31 seminarians and 4 priest scholars currently in their scholarship program as well as many more applicants in various seminaries in Luzon, Visayas, and Mindanao. For ticket inquiries please contact Ms. Louiza Asinas, Events Department of The Bellevue Hotel, Tel. (02) 771.8181.